Over this past year I have been growing more and more obsessed with flower arrangements created and inspired by Dutch Master's Still Life paintings. I even considered taking a floral design class about creating such arrangements last March that was run by The Little Flower School in Brooklyn. The leaders and teachers of the school, Nicolette Owen (Nicolette Camille) and Sarah Ryhanen (Saipua) are leading the Dutch Master's trend that we're seeing in weddings lately, as their style intrinsically belongs within this realm of dark, lush and romantic styling. Looking at their work on Instagram [Nicamille] + [Saipua] makes me drool every time. 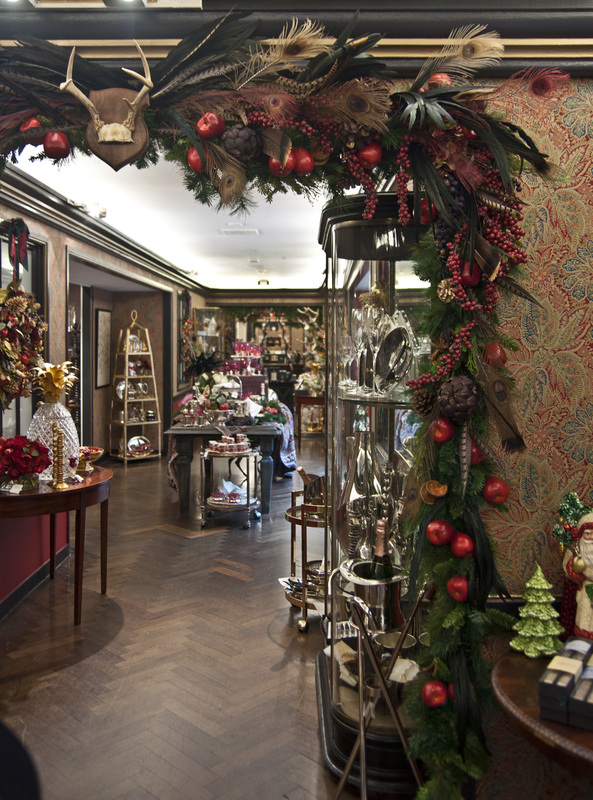 This obsession needed to be included in my reality of work, so I was so excited when I realized I could use this concept for my Holiday Decor theme at Bergdorf Goodman on the Decorative Home floor! It ended up working perfectly, as we were pushing for a more traditional style design from last year's Malachite, and also wanted to remain within the company's initiative to utilize the overall conceptual theme of "BG INSPIRED." Since the windows were inspired by the Arts, one of the floor's decor could naturally be inspired by traditional still life painting. So how is it that we can use these elements to create the look? After I gathered the list, I analyzed each element and came up with a plan for how to incorporate each. 1. PRODUCE - In order to get the produce element right, you want to think about using fruit and vegetables that is close to being within season - Oranges, Pomegranates, Apples but also to make the produce seem different from the typical dried fruit often used in holiday decoration, you want to add unexpected ones too. Figs, Grapes, and artichokes are often represented in Dutch Master's Paintings and they're not as often used in Holiday arrangements. 2. TAXIDERMY - It's really tricky to hang dead animals from garlands and may not be the most festive and welcoming idea. So to get around that while still evoking the theme, you can add the feathers from the birds that are commonly shown in these paintings. You can also, put these taxidermy birds on tables or walls to create beautiful, festive vignettes. My favorite birds and feathers come from Pheasants, Turkeys & Roosters. 3. FLOWERS - Flowers are a very important element to pull of this look and I'm sure you're curious about which flowers to use and why does it make sense to put them in holiday decor. I decided to choose something that could realistically be saved and reused for the holiday. That's where hydrangeas come in - I hope saved your dried blooms or are able to pull some lasting bits from the bushes outside. 4. STYLING - Dutch Master's Still Lifes are all about over abundance. They portray romance through heavy and loose styled arrangements and table settings. One last trick that we did in the center of the hall, which I think is really fun - replace your table cloth with a persian rug! The major key to pulling off this look is, more is more. 5. DARK COLORS - Most Dutch Master's paintings are very dark and moody. We of course, can't and don't live in candlelight in present life, so in order to create that mood all of your added elements and decorative finishes should be dark and moody. Use dark rich colors for your table clothes and napkins, if you're adding gilded elements the dark golds and even unpolished silver mixed with polished silver will enhance the feel. There you have it, I hope I've sparked a few ideas for your holiday decor this season. Make sure you stop by the store on the 7th floor for an even closer look. Thanks for reading. In the last few years I've built up a pretty nice shoe and accessory collection, making it a point to invest in some statement pieces and purchasing others when I come across a great sale. Now into my thirties (yikes! ), in addition to investing in more grown up pieces, I've also decided that it's time for a more grown up way to store them. And what better solution than a jewel box that can not only store but also showcase them! I was lucky to be gifted an old cupboard with glass doors that is about 50"h x 40"w x 13"d - the perfect size. The cupboard on it's own was looking drab (see before picture after the jump). However, a simple paint job and wallpapering on the inside with a rich jewel toned print, transformed the piece from shabby to chic. My last step was to purchase glass shelves cut to size. I figured glass would be the best option, it's virtually invisible and will not detract from the objects or the wallpaper. The glass company I used is Bear Glass, they're in the city, but also ship nationally and have reasonable prices. They will cut to whatever specification you have and if you're looking for mirror have a great range of options. My shelves were 1/4" thick and I asked for eased edges - so that they're not sharp. 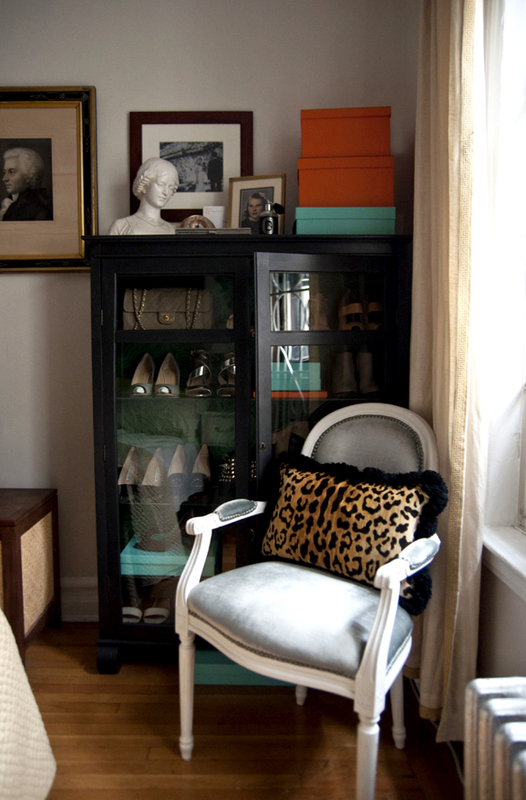 Since the shelving unit is a little below eye level I wanted to create a vignette of personal items on the top. I hung a candid picture from our wedding day on the wall as a back drop along with a bust for hats or jewelry. As well as framed images of my grandmother and my dog Rita. In the boxes I am storing miscellaneous soft accessories and scarves. On the shelves, I mixed and matched bags with shoes to add a little extra interest. At some point I may place the bags back in dust bags but I think since they're behind glass, dust should not be too much of an issue. Also, I have the unit next to window but there are curtains and blinds that I can pull to prevent sun damage. If you'd like to have a similar custom display unit, its most definitely possible. It's not the cheapest of the cheap, DIY project but definitely a statement piece. If you have the time and the resources to comb flea markets or antique stores, you can start there by looking for a cabinet of similar proportions. If you do not or would like to save time, the unfinished furniture store should be your first stop - the Millstores always have inexpensive unfinished bookcases or armoires. Next, you can purchase wallpaper from Design Your Wall or Decorators Best's - my cabinet only took one standard 11 yard roll to cover, the wallpaper I used is by Cole & Son, it's a Fornasetti design called Malachite in green. Lastly, a paint color of your choice for the outside. Wallpapering is surprisingly easier than I was expecting. The most important step is understanding the repeat. Each pattern has a set repeat that is measured horizontally and vertically. You need to figure out what that pattern is. Each piece you set on your object will determine when you have to make your next cut. Otherwise, applying paper is quite easy. It involves wallpaper paste, a roller or brush, and a table or surface to use to apply the paste. Other supplies needed are razor blades, a straight edge and measuring tape, a sponge and a spatula of some sorts to help smooth the paper onto the wall. If you're going to try it out for yourself there's a pretty good tutorial on this website [here]. A good place to start also, is with small things like a tray - which is the first thing I did when I tried wallpapering for the first time [see above]. Now that I've finished this project, I'm dying to work on the next. It's such a good feeling when you accomplish a project all on your own. So empowering! And I hope, inspiring for you. Thanks for reading. Wow it's been such a long time since I've checked in on the progress of my apartment! To no surprise that means I haven't been really doing much. Between life at work and friends I've been very busy with putting my energy towards other things. I did manage to, but never wrote about: 1. painted my bedroom an off white color called Bone China, 2. hung the large Chinoiserie screen my mother gave me up behind our bed, and 3. mounted those ceramic birds I bought at Brimfield [here] on the wall in my bedroom. This all happened a few months ago, just this weekend I photographed the progress! They're looking pretty sophisticated, aren't they! On the left side (my side of the bed) I have the dressing table, which doubles as a night stand and on Jack's side, which is the view you see from the living room I chose to display pictures and artwork related to our wedding and honeymoon. The top oval image is a photograph of me on my wedding day, the octagonal framed piece is a Sailor's Valentine created by a friend, Lynda Susan Hennigan as wedding gift, the gold frame an old photograph of Venice (where we spent part of our honeymoon) given to us by my mother, and below that is a wedding card given to us by my godmother Gail that is cut out card, also of Venice, and lastly the framed black and white photo on the table is of us on our wedding day. Although these are all sentimental and very personal, I think they're conceptual enough that they display nicely in the bedroom. Sadly, our night stand is starting to sway to the left, I have no idea why or how, fingers crossed it doesn't collapse someday! Moving on. . .
For the month of July I am setting goals and focusing on moving closer to accomplishing them. It amazes me how many projects I accomplish on a weekly basis at work, but how little gets done at home. On the top of my to do list is to get going on my Porter chair - I bought that about 9 months ago. The latest updates I've made to it include puling the existing fabric off, sanding down the horrid spray paint finish and starting to paint the under layer a dark navy. The inspiration for the final design came from the Instagram account of Erica Cook (ecmothdesign) of Moth Design. She posted this couch months ago and there it was my answer to my dream chair. 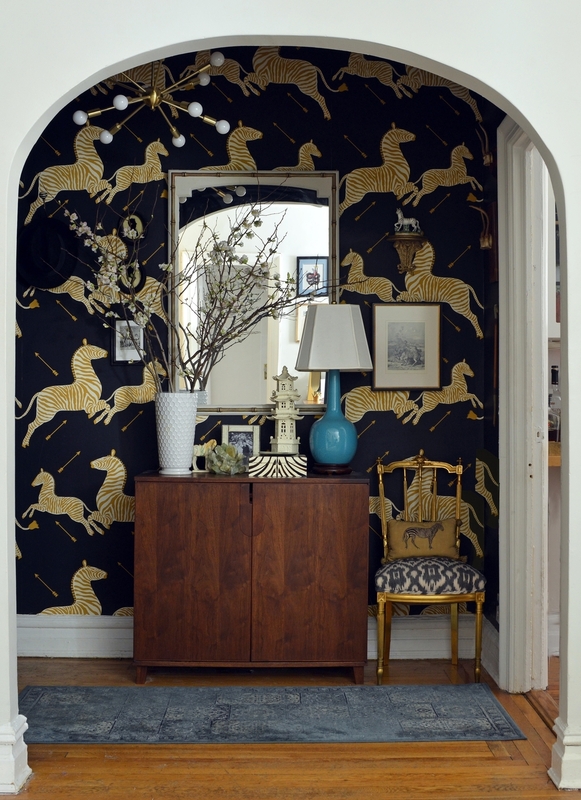 Dark velvet with gold leaf finish. In the time between I've settled on two different choices from Kravet. One 100% cotton velvet that is slightly warmer in tone and is about $20 more yard than the other that is a poly blend. In this extended time I've learned how to gold leaf. With one at home and two at work projects under my belt, I'm ready to get to working on my chair. So I guess the time hasn't been completely wasted. On another note, I really would like to have my kitchen to finish before September. I was going to try to accomplish the tiling this long weekend with my father, but he was unavailable. Another project that's been creeping along is the coat closet at the end of the book shelves. Jack cut all the pieces last fall, but we have yet to construct the final unit. I'm hoping that I can convince him to finish the project this month, then finally I can show that very messy corner in the living room that's I've been hiding all along. I recently discovered the ease of gold and silver leafing. For so long I thought it was a finish left only to the gifted trade. Until when at my old company, someone showed me how easy was to leaf practically anything. It still has taken me several years attempt the process myself. I also always expected it to be extremely expensive. After a little research I discovered, it's really not that expensive if you go with the combination leafs. You can use real gold and real silver for your special or smaller items which will not set you too far back, or if you're interested in covering large surfaces I suggest going with the imitation gold and silver routes. You will hardly see the difference with the end result if you properly apply the leaf and do a few additional steps. In this post, I'm also adding a step by step tutorial for some horseshoes I recently leafed for a bridal shower I hosted. Gold horseshoes sound like such a luxury and they would be, if you were including the cost of my time. Supplies: I purchased the gold leaf on Amazon.com, there are a number of companies that sell various finishes and if you're a lucky Prime member you can get free shipping through a few of the sellers. The real gold leaf can be found through Gold 24K [here] at about $.40 per sheet. This is also edible and can be used in cooking, desserts or if you're REAL fancy in champagne... I've heard about a bar in the Meatpacking District that sells gold laced Dom Perignon - you could be so exuberant for a party if you'd like. Or you can purchase imitation gold leaf at the economy rate of $.11 per sheet through L.A. Gold Leaf [here] or the easiest packed form through Speedball at $.30 per sheet [here] - the positive to Speedball is that it's the easiest to use and qualifies for Prime. *Please note: the imitation leafs are not edible. In addition to the leaf itself you'll also need to purchase an adhesive. I bought the Speedball brand adhesive [here] for $30 for 32 oz for a large project and the 2 oz is also available for smaller projects. There are other brands that when wet are blue and turn clear when ready for the leaf - those are available at art stores and may be pricier. Not really sure. You'll also need a soft brush or sponge brush. Lastly, if you're leafing on a surface that is porous, you'll need a sealer. Which should be your first step. The first few steps that I needed to take with the were to clean the horse shoes. After scrubbing by hand, my father discovered that you can attach a scrub brush to a screw driver and it certainly works like a charm. However, you must be careful and you must wear safety goggles and gloves for protection. Since the horseshoes have a thin surface area, I cut the sheets down to a more manageable size. First step, you brush the adhesive onto the object being leafed and let it sit until tacky. Some adhesives are ready in 15 - 20 mins, others take an hour and it will remain tacky for for up to 24 hours. Next, apply the gold leaf, it is easiest to use wax paper or to use the sheets that are placed between the leaf. The leaf it is so thin and light weight that it sticks to your hands. Use a soft brush to adhere the leaf to the object. Continue these steps until the entire piece is leafed. If you overlap the leaf, that is fine, it will just brush off. Once leafing is complete there are a few options that you can do to finish the process. As you can see in the below photos the gold is not quite rich enough, I think it is too shiny and needs a bit of age to tone it down. The quickest to way to achieve this look is to rub a dark wood stain over top and wipe off the excess. Not only will it bring out the richness in the gold color, it will help seal the gold onto the object. One more coat of shellac may be an additional sealant. I used these horse shoes as favors for the bridal shower I hosted. Other than just being fun and attractive, they can also look great hanging on a door, all that you need is a thin ribbon to weave through the nail holes and viola! A pretty, lucky, horseshoe for your entrance. I hope this was fun and that you'll try to do it yourself. As always, thanks for reading! This weekend I tried something completely new and attended a class with the Little Flower School Brooklyn led by Nicolette Owen and Sara Ryhanen held in Red Hook Brooklyn at The Atelier Roquette. The focus was on Spring flowers and learning about color and texture within flower arranging. I learned so much and have now caught the floral design bug. All I want to do is scan, forage and comb the woods and delis of both Connecticut and New York City to gather Spring blooms to create as many beautiful arrangements as I can. I'm so inspired! Take a look at the photos I shot from the day. . . it was impossible to take a bad one! And of course, my creation. I would encourage anyone interested in trying something new to make the jump and do it! If you're interested in attending any of the future classes with the Little Flower School Brooklyn, I would suggest you sign up with their newsletter, to stay on top of classes. This one was added at the last minute - I only found out because a friend told me.